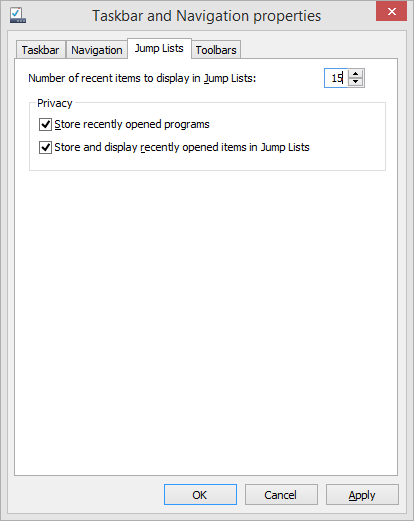 Jump lists are a major component of the taskbar in Windows 8. When you right-click on an application icon, you are presented with a number of options relevant to that app. Depending on the app, different items are displayed. Microsoft Word displays recently opened office documents, Internet Explorer and Chrome display recently visited web sites. The number of items that display in the list are easily customizable. Click on the Jump Lists tab. Adjust "Number of recent items to display in Jump Lists." For extra privacy, you can disable all recent items from displaying in Jump Lists by removing the check next to both items in the privacy section. Click OK and your changes will be active immediately.